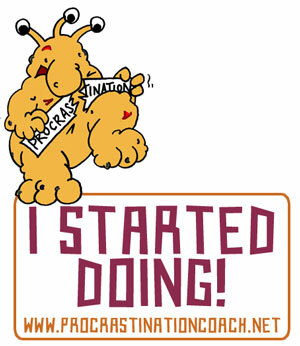 Join Get It Done Week at Procrastination Coach. Learn how to get unstuck and get yourself into gear. From Monday to Friday, the daily tasks will help you get your things done AND learn how to deal with procrastination at the same time. We’ll be searching for what works for YOU, there are no prescribed models involved. Work with a supportive group who know why ‘just do it’ doesn’t work. Or you can work alone if that’s your preferred style. Imagine a project that you struggle with or that you avoid. Decluttering, art work, your administration, writing a book, self care, fixing a leaking roof, anything goes. And now picture yourself at the end of the week, stunned and satisfied. You look at your project and it’s done! Or at least you’ve made serious headway. How does that feel? To start in May costs 30 euro. If you expect to love it, you can buy 3 times for 75 euro. We will start every first whole week of the month, except for July and August. After paying please join the Facebook group: https://www.facebook.com/groups/AndActionAgainAndAgain/ That’s where the materials will be posted. If you prefer to do the course outside Facebook, please send me an e-mail and I’ll create an enclosed space on my website. * This is my second course with Angela and I’m already signed up to do more. I love her clear and kindly approach and get a real lift from her feedback. I love the structure of the course – everything is in bite-sized chunks, light-hearted and realistic. I really benefit from the group sharing and encouragement. Five days a month of procrastination busting will change my life! * I liked Angela´s course very much since it gave in a mini-period of time, with minimum effort, the crux of why I postpone certain important things in my life. Angela´s feedback, and the experiences and feedback of the other groupmembers gave the whole exercise an extra boost. I also liked the fact that it was an english-speaking group; the idea that we are universally human and procrastinating, whether we’re dutch, american or whatever, is nice. * Angela’s guidance helped clarify my goals, helped me set priorities, and helped me identify behavior that was getting me off target. With the group I was able to share my plans for the day and then report my completion, getting cheers for successes and suggestions for things that tripped me up. This is a very simple way to learn some good habits. So very true – procrastination is an absolute killer! We must stop procrastinating and start doing!